I begged for 2 spots to be opened up for Gem and Jade to attend! They said 'Yes' and the girls went for the whole week! They had a great time, and made FRIENDS!!! And we got introduced to the Registered Churches here, and we made some friends! The singing, action songs, crafts, food! teaching English at a preschool. Not what I had planned. 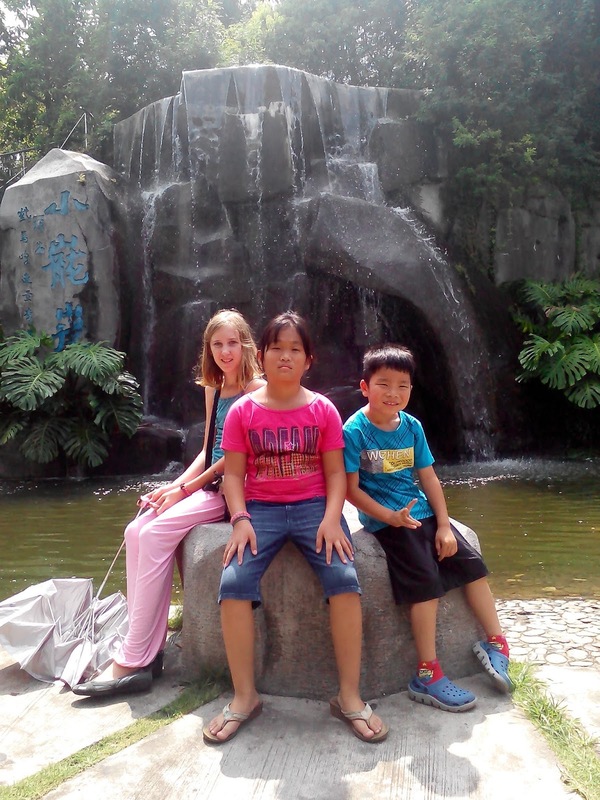 I've learned via other Expats that EVERYONE assumes you're an English Teacher when your living in China and EVERYONE will come knocking at your door asking you to teach their child. "No, I homeschool my children, I have no time......"
In our situation, we decided fairly early on that we wanted Lukai to attend School. I tried to home school him, but it just wasn't the right fit for him. He is SOCIAL and I think Homeschooling would have frustrated him. 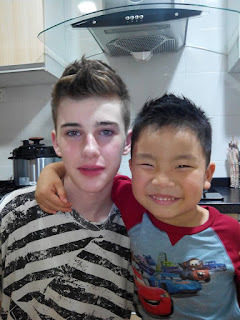 So off he went to a local preschool that was recommended to us, and we were amazed at how quickly his fluency of Mandarin came back to him and how quickly he made friends. But as all things via school related here in China is, I became aware of how EXPENSIVE schooling is for expats!!! The kids are not permitted to attend 'local' schools so we are left with private/international ones.....they are like the schools from 'Dead Poets Society' . These school are gorgeous! Well, we had been praying for a clear open or closed door. So with alot of fear, I said 'Yes' and I quickly immersed myself with TESOL for preschoolers. Sites like Super Simple Learning became my lifeline. I was shocked and amazed at how I was able to put together an 1hour curriculum that included awesome ways of teaching Greetings, Alphabet, Phonics,Calendar, Weather, Colors, Shapes, Story time, Craft time, Parts of the Body, with loads of great singing and games. it was totally the Lord. He showed me e.v.e.r.y.t.h.i.n.g. I had not a clue! I take no credit at how incredible these classes have become. Attendance doubled within a few months at the preschool as word spread about the class. The Teachers were thrilled! The Parents were so happy. And we are able to send Lukai with his tuition paid. He was so happy. And once again, God provided a way. This was never part of our plan when coming here ~ we were only thinking about the Foster Home. But this opportunity has allowed us into the community in a whole new deeper way. We are making friends because of it. We are building relationships because of it. I was reminded this week as I was feeling frustrated at the little we are contributing here, that I need to remain faithful to where He has us planted. He has a purpose that He is unfolding, and I have a part. I just need to remain faithful and trust Him to bloom where I am planted. I am reminded that the opportunities I have to build relationship here is precious. I have nothing to share without relationship. And maybe that is all this 'Teaching Thing' is about....building relationships within the community. It doesn't matter, I don't need to see the whole plan.....I need to trust. I can remember that, be faithful with the 'talet' He has given me and prove myself a good and worthy Servant. but politics being what they are here....that awesome door sadly got shut fast. and I was reminded this week that this Teaching Opportunity IS from Him. The other day the Wife decided that BigD needed a haircut. So me and BigD wandered down to the local fancy hair cutting place and got BigD's hair washed and cut. While he was off in the back of the shop having his hair washed, I could hear quite the commotion... but I could not see what was happening. I could hear the hair washer yelling"放松" (sound like Fàngsōng) which means "relax" in Chinese. It was kind of funny sounding because the "放松" was always followed by a *whack* sound and an "OW!" Now, I'm not an idiot... I mean, I may be, actually, we're not sure. But I knew what was going on. My son was probably freaking out because he doesn't like going to the fancy hair cutting place and having people wash his hair. I had visions of him curling up into the fetal position and trying to avoid all human contact while the poor underpaid hair washer just wanted to finish washing his hair and get onto the next customer. Somewhere along the way, the hair washer thought it would be a good idea to start yelling "放松" (relax) at the foreigner and hitting him in an effort to make him more comftorable. Of course I did what any good Dad would do... I got out of my seat and walked into the hair washing station so I could watch and laugh. And all I'm thinking is, you know, maybe, yelling at someone in a foreign langauge and hitting them may not be the best way to get them to relax... I mean, That's not helping. My back is soaked in sweat, my front is soaked in sweat... my wife laughs at me because I sweat through my pants... I can feel the sweat running down every inch of my body... except my underarms. Thank goodness my underarms have deodorant! Otherwise I would probably smell really bad... oh wait... never mind. I mean, if I wanted the deodorant to help, I'd probably have to cover myself head to toe with it! Because as it is, I've got 2 nice dry patches under my arms, while the rest of me looks like I went through an automatic car was without a car. And all I can think, while I'm wringing out my clothes at the bus stop, is That's not helping. And while I'm wringing out my shirt at the bus stop, I see some guy working on adding a new store sign to the building. He is crouched on the sidewalk with his welder and is spot welding some steel frame for the sign. I'm really happy to see that the work place saftey people are starting to make a difference here... I mean, last year, this guy probably would have been welding with no saftey equipment, but now... well... he has his knock-off RayBans on protecting his eyes, and while the welded molten metal is flying past his face at temperatures of 1000 degrees F (550 degress C) I notice that he is wearing a paper mask to protect his face from said molten metal... at 1000 degrees F... paper... 1000 degrees moten metal... paper. The paper mast was held in place by his RayBans, and the best part, was that someone drew a picture of a face on it so they knew where to cut out the eye holes. As the local children danced and played in the molten metal sparks, trying to catch them in their hands, I'm just looking at this workers paper mask thinking, man, That's not helping. If I can't understand what they are saying in Chinese, they decide to write it down... as if I could read it... not helping. When we goto a restaurant and order some ethnic dishes, they tell me what it is BEFORE I eat it... not helping. Telling the children that the live animals in the restaurants are not pets, but actually found in the sewers... not helping. Sticking crazy long needles in your body expecting that it wont hurt and actually take away pain (I'm looking at you crazy little acupuncturist)... not helping. Donuts with fish inside... not helping. ... MissP is NOT happy. Not happy at all for some reason. See, I knew that this particular morning she was having a rough time. Nothing specific... just in a bad mood. So when we left the apartment, I held her hand as the 4 of us walked along. We climbed onto the bus and I sat beside her and let her cuddle against my shoulder for the bus ride. When we got to the park, again I held her hand and talked with her while we talked. After we fed the fishes, I held her hand and made sure we chatted and laughed while we walked to go buy some ice-cream. But for the whole time, she was just not happy. Grumpy and complaining about... well... pretty much everything. When we got home, we talked about her attitude and how her bad attitude made it difficult for the rest of us to enjoy our time out. Her constant complaining and pouting was and continues to be an ongoing struggle. Wife: Why were you so angry in the photo? MissP: I wasn't angry, I just didn't want to smile. MissP: Because I wanted to be dramatic and I didn't want to have to smile. Wife: But why? Weren't you having fun? MissP: I wanted to get attention. And that's when my heart broke just a little bit... see, we went around for a long time before she finally said that - she said she "wanted attention." Me: You wanted to get my attention? But you had my attention. I knew you were sad today. When we walked to the bus, whose hand was I holding? Me: And when we got on the bus, who did I sit with? Me: And who did I let lay on my shoulder for the whole bus ride? Me: And when we got to the park, who did I walk with and talk with? Me: Can't you see that you already had my attention? You didn't need to try to get it. You were so busy being hurt and feeling that you were not loved, that you missed all the love and attention I was giving you. It still breaks my heart that even after 5 years of being part of our family, she still feels that she has to fight for attention, that she feels unnoticed, or unloved, when we all pour so much love and attention into her. And I'm left with this feeling of... That's not helping. Like my wife has said before, some of our children can be like a broken vessel, you can pour all your love and hope and acceptance into them, but they can be so broken that they can not receive it, or at least not hold onto it... it just passed through them. That's why I have to continually remind myself that I can not fix my children... I can not fix anyone. I can keep pouring love and acceptance into them and hoping some of it sticks... but ultimately, my hope has to be in He who can actually fix people, and put broken vessels back together. He is planning on going into ministry, and I couldn't be happier for him. For all who know him, they know this is exactly what he was made for. and Skype with a very special young lady back home. And I am SO proud of myself for making an icecream cake. Ice Cream cake + Tropical weather = Messy! but your brothers and sister are there forever. The best gift you can give yourself is to make friends with eachother..."